Background: Plants must cope with daily fluctuations in temperature, light, and humidity. Plants continuously adjust their water status by regulating transpiration through stomatal pores present on their aerial parts. Plants also act on the water transport capacity of their root and shoot tissues, which mostly involves aquaporin water channels present on cell membranes. The synchronization of these processes with environmental cycles is ensured by the circadian clock, an endogenous, cell-autonomous biological timekeeper that produces outputs with rhythms close to 24 h. Circadian rhythms are based on numerous molecular and cellular mechanisms. Compared to common mechanisms based on gene regulation, reversible phosphorylation represents a key, highly flexible mode for aquaporin regulation. Question: We previously demonstrated that phosphorylation at two C-terminal sites (Ser280, Ser283) of the Plasma membrane Intrinsic Protein 2;1 (AtPIP2;1), a major plasma membrane aquaporin in leaves, is necessary but not sufficient for the diurnal regulation of leaf hydraulics in Arabidopsis. In the present work, we wanted to determine if this process is clock-regulated and we addressed the underlying molecular mechanisms. Findings: The daily rhythms of leaf hydraulics reflect a genuine circadian rhythmicity and are correlated with circadian oscillations of AtPIP2;1 phosphorylation, as shown by combined immunological and proteomic approaches. We used this context to investigate the supporting role of so-called 14-3-3 proteins; these phosphosensors are known to interact with phosphorylated client proteins to change their activity, localization, stability, or association with protein complexes. While 14-3-3 proteins were previously shown to interact with aquaporins, we uncovered a physiological role for these proteins in plant hydraulics via the regulation of AtPIP2;1 activity and water transport in leaves. 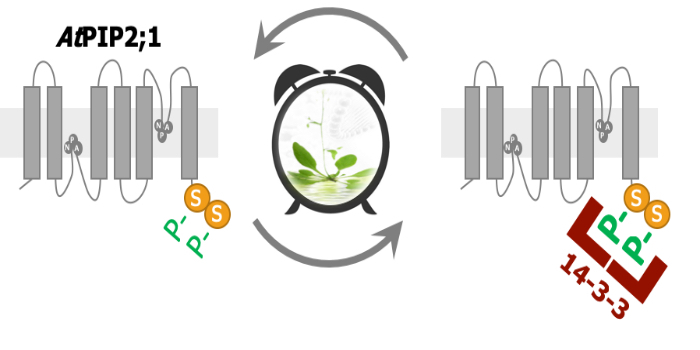 We propose that this regulatory mechanism assists in the activation of phosphorylated AtPIP2;1 during the circadian regulation of leaf hydraulics. Next steps: The present work provides a refined mechanistic understanding of the daily rhythms of leaf water status. 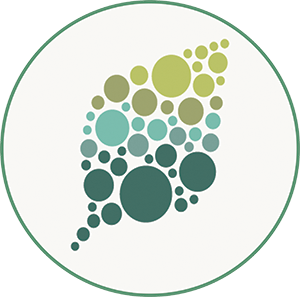 Leaf water status is at the crossroads of fundamental physiological functions of plants, including growth and adaptation to environmental changes. We plan to use our new knowledge as a basis for genetically manipulating and improving crop performance in response to environmental changes.